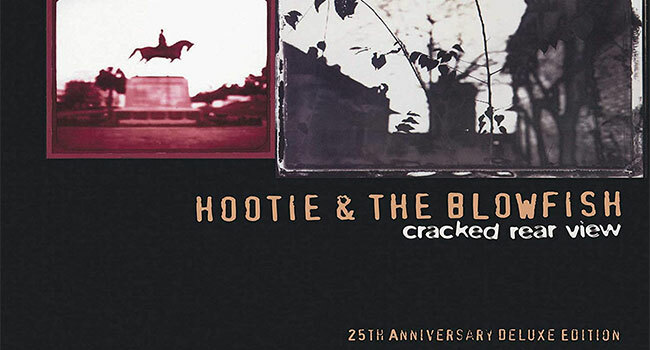 Hootie & the Blowfish are celebrating the 25th anniversary of the band’s debut album, Cracked Rear View, this year. The monumental record is currently the tenth best-selling album of all time in the U.S., certified 21x Platinum by the RIAA since its 1994 debut, as well as the best-selling debut album of all time. To commemorate the anniversary, the band will release two new versions of the monumental album with remastered, rare, and unreleased audio on May 31st in conjunction with the launch of their extensive North American Group Therapy Tour on May 30th. Cracked Rear View: 25th Anniversary Deluxe Edition will be available from Rhino Records as a 3 CD/DVD Deluxe Edition set on May 31st. A 2 CD Expanded Edition, digital download, and streaming versions will also be available on the same day. The 3 CD/DVD Deluxe Edition includes a newly remastered version of the original album, rare and unreleased studio and live recordings, plus a DVD with surround sound mixes, the original music videos from the album and more. The set also comes with extensive liner notes written by Tim Sommer, who signed the band to Atlantic Records in 1993. The band – Mark Bryan, Dean Felber, Darius Rucker and Jim “Soni” Sonefeld – recorded Cracked Rear View at NRG Studios in Los Angeles with producer Don Gehman. Released on July 5, 1994, the album became a musical phenomenon, topping the album charts in Canada, New Zealand, and the U.S., where it reached No. 1 five different times during 1995. The album generated four massive singles: “Hold My Hand,” “Only Wanna Be With You,” “Time,” and “Let Her Cry,” which earned Hootie & the Blowfish a Grammy Award for Best Pop Performance by a Duo or Group and also saw them recognized as Best New Pop Group by the Grammy® Awards. Both new versions of the album are packed with rare recordings. Among the highlights are early versions of many of their biggest hits recorded in 1990 and 1991 and only available previously on cassettes sold at their live shows; the band’s five-song 1992 Kootchypop EP; and other unreleased and rare studio tracks. The Deluxe Edition DVD includes a 5.1 Surround Sound mix of the original album and 24/96 stereo mixes of five bonus tracks. It also features music videos for “Time,” “Let Her Cry” and three more songs.